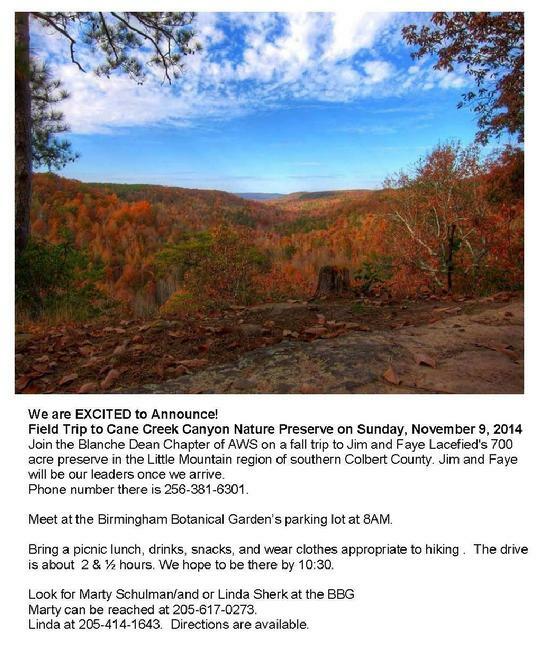 Join us for a Wine & Cheese Nature Walk at Turkey Creek Nature Preserve, Pinson, AL. We will meet at 2 p.m. in the parking area near the exit. Plan to explore the forest led by the preserve’s education specialist, Zac Napier. Rain date is Sunday, April 30, 2017. 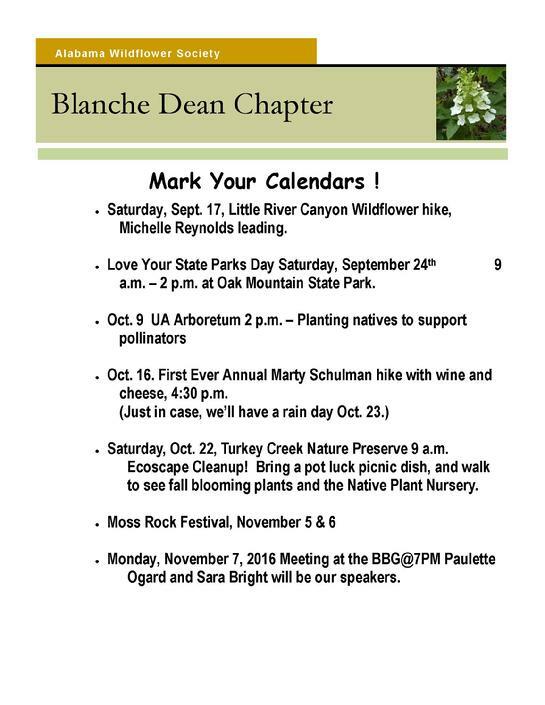 Cost is $10 but limited to 30 Blanche Dean and Friends of Turkey Creek members, so don’t wait to reserve your spot. Interested parties can reserve by emailing friendsofTCNP@gmail.com or calling Karen Hutchinson@205-218-6800 before April 15th, payment to be made at the event. 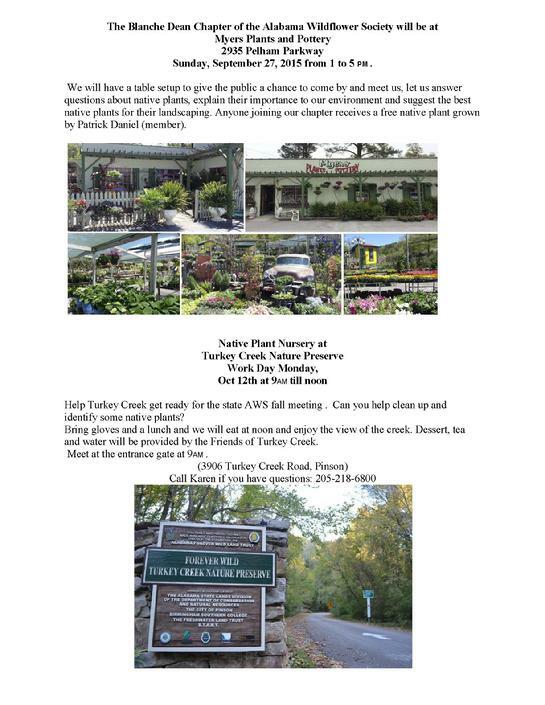 Meet at 7 pm for our regular meeting at BBG - speaker will be Zac Napier, Education Specialist for Turkey Creek Nature Preserve, Zac leads great naturalist hikes - topic to be announced. 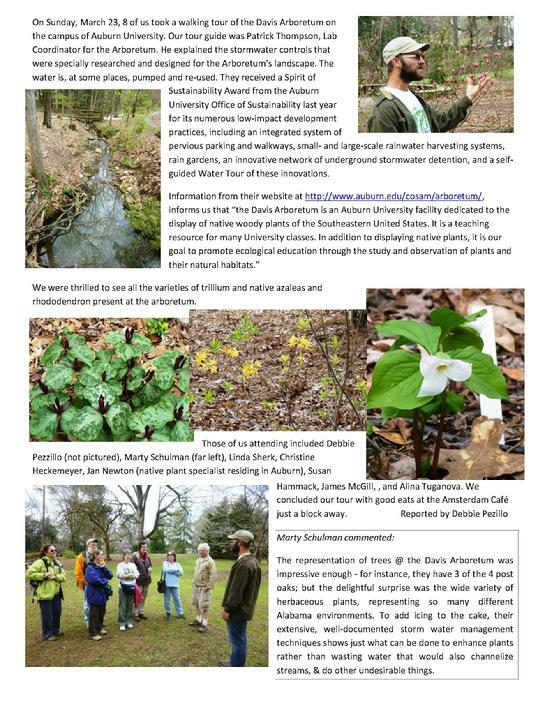 Saturday, April 8, 10:00 to 11:30 a.m. at the Crosby Arboretum in Picayune, MS.
Join Heather Sullivan, Mississippi Department of Wildlife, Fisheries, & Parks Botanist, for a spring walk through the Arboretum’s exhibits. She will discuss ferns and flowers encountered along the journey. The program is free to Crosby members; non-members $5. Register by April 7. Boots recommended. Saturday, April 8, 1:00 - 2:30 p.m. at the Crosby Arboretum in Picayune, MS.
Join Arboretum staff members Jennifer Buchanan and Pat Drackett on this field walk to explore the carnivorous species of plants found in the Savanna Exhibit and their habitats, including sundews, bladderworts, and pitcher plants. Crosby Members free; non-members $5. Register by April 7. Boots recommended. Saturday, May 20, 10:00 to 11:30 a.m. at the Crosby Auditorium in in Picayune, MS. Learn to recognize and enjoy many of the thirty species of orchids native to the Gulf Coast! 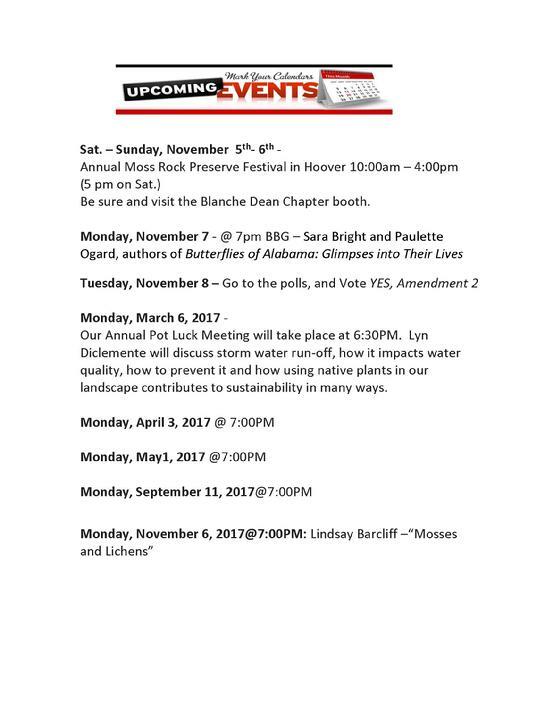 Glen Ladnier, long-time orchid enthusiast and member of the Gulf Coast Orchid Society, will discuss habitats, plant and flower characteristics, and touch on common conservation techniques, before leading a short field walk to visit native orchids blooming in the Arboretum exhibits. Crosby Members free; non-members $5. Register by May 19. 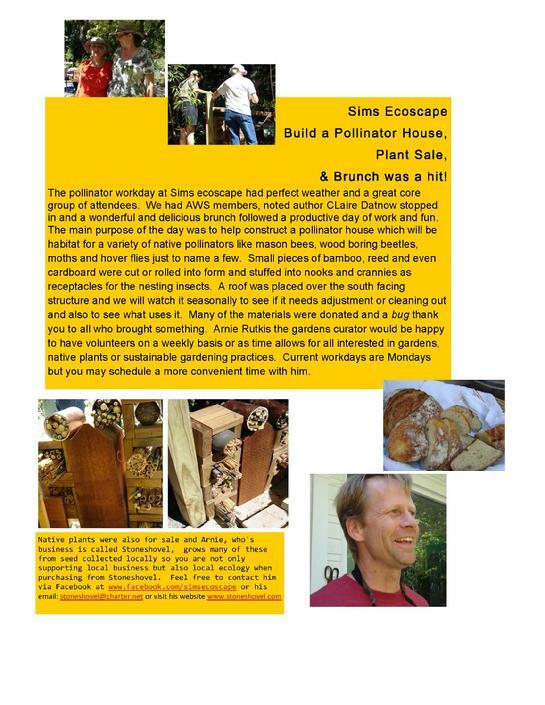 Reservations: Call the Arboretum office at (601) 799-2311 for questions, and to make program reservations. 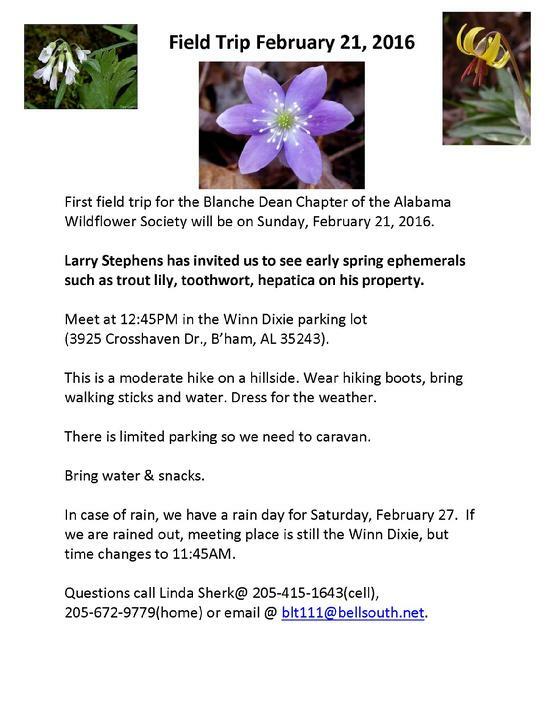 Physical Address: 370 Ridge Road, Picayune, MS 3946 6Hours of Operation: Wednesday-Sunday, 9:00 a.m.-5:00 p.m.
First field trip for the Blanche Dean Chapter of the Alabama Wildflower Society will be on Sunday, February 19, 2017. 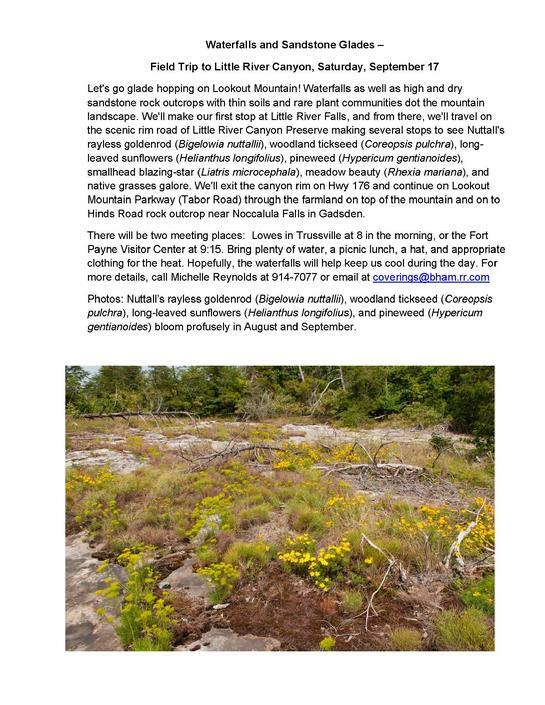 Larry Stephens has invited us to see early spring ephemerals such as trout lily, toothwort, hepatica on his property. 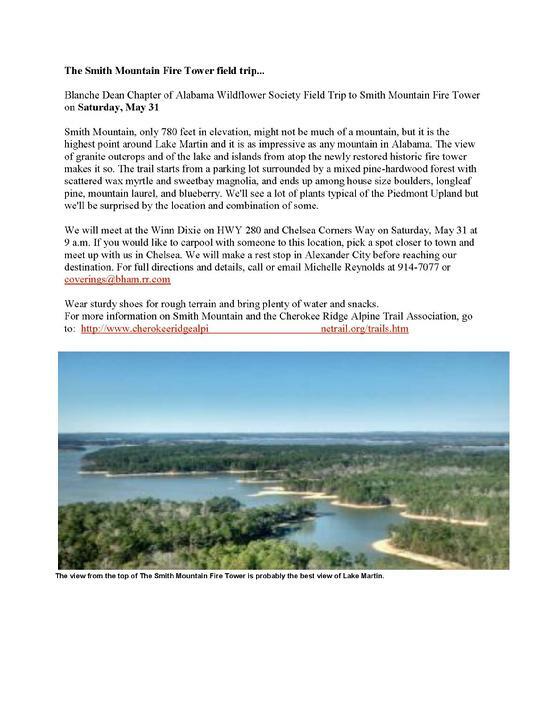 Meet at 12:45PM in the Winn Dixie parking lot(3925 Crosshaven Dr., B’ham, AL 35243).This is a moderate hike on a hillside. 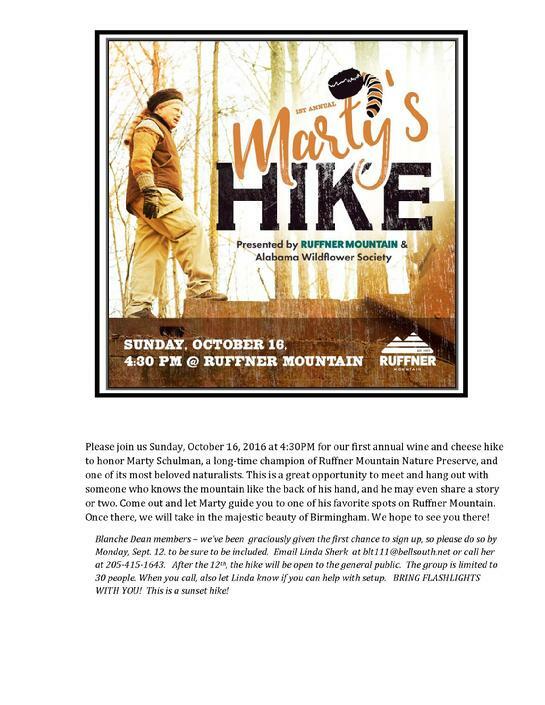 Wear hiking boots, bring walking sticks and water. Dress for the weather.There is limited parking so we need to caravan. In case of rain, we have a rain day for Sunday, February 26. If we are rained out, meeting place is still the Winn Dixie at 12:45PM. Bring water & snacks.Questions call Linda Sherk@ 205-415-1643(cell), 205-672-9779(home) or email @ blt111@bellsouth.net. 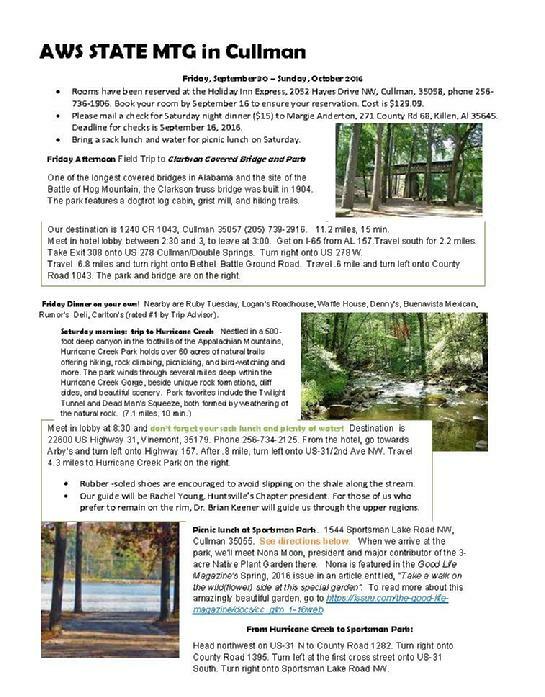 Check out these hikes on private Freshwater Landtrust property. These properties are rarely seen by the public and if you get a chance to attend it will be memorable for sure! bugspray. Wear long pants to protect against poison ivy and bugs and sturdy shoes. Area is mostly rolling hills and reasonably level. Augusta is providing drinks and dessert. Directions: From the Summitt we will travel on I459 west until it intersects with I59 and head for Tuscaloosa. When we near Tuscaloosa look for the exit to Moundville or Hwy 69 South. Drive through Moundville, 6 miles south of Moundville keep right onto AL Hwy 60, then left on AL 14 toward Greensboro. In Sawyerville turn right on Co. Rd. 17 across from the Post Office. Augusta Robinson’s place is 4 miles on the right. Her cell is 205.394.9144. 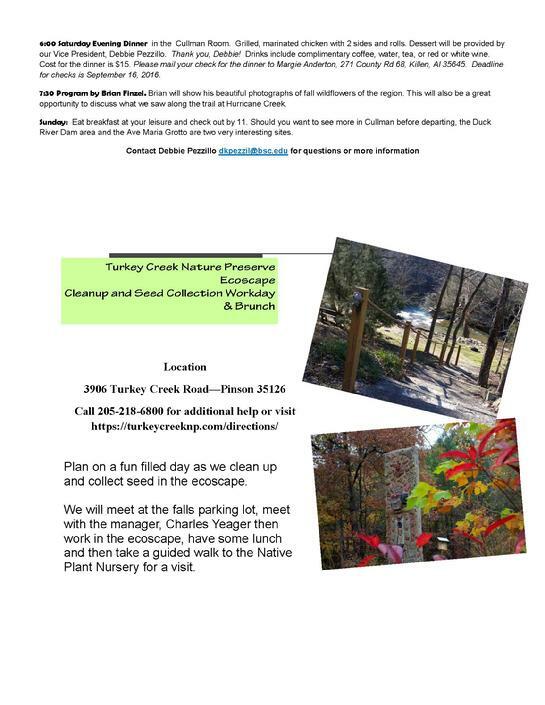 Our April field trip will be to Cane Creek Canyon Nature Preserve in Tuscumbia on Sunday, April 19. 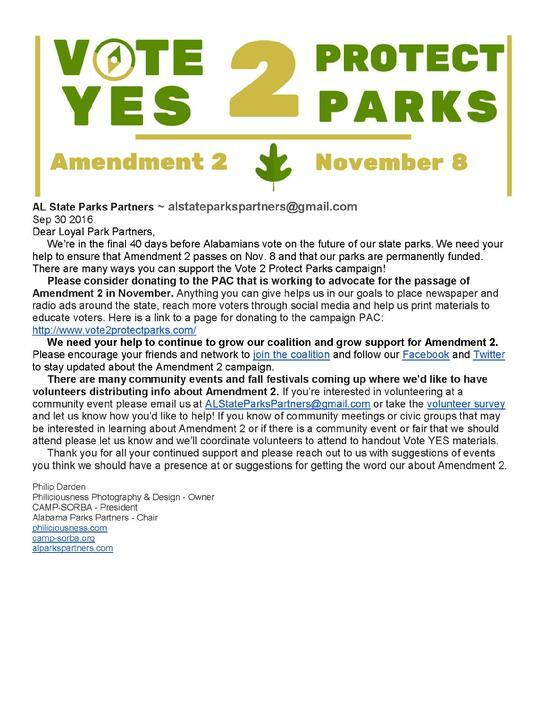 Meet at The Birmingham Botanical Gardens parking lot at 8AM. 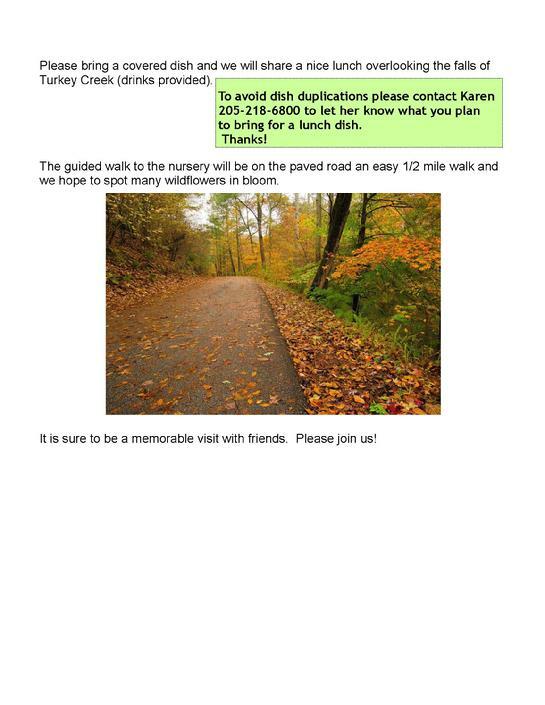 Bring a picnic lunch, drinks, snacks and wear appropriate clothing for hiking. The drive is about 2 & ½ hours and we plan on arriving by 10:30AM. 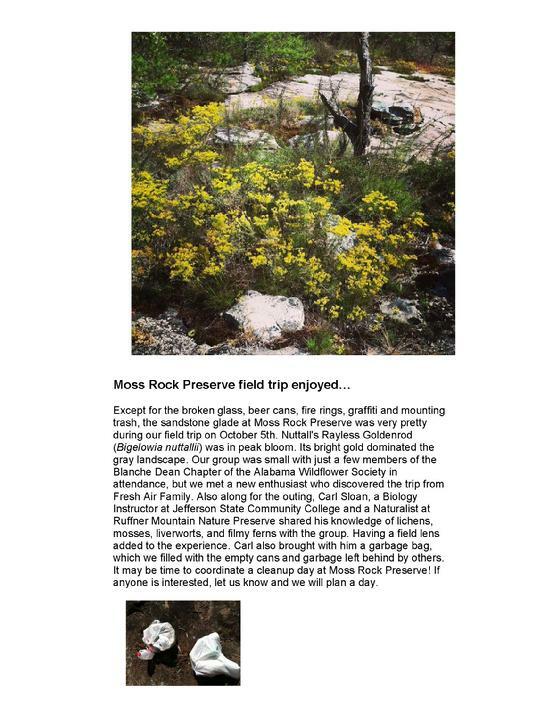 Here is a chance for those of you who couldn’t make our November trip to come this time in the spring. 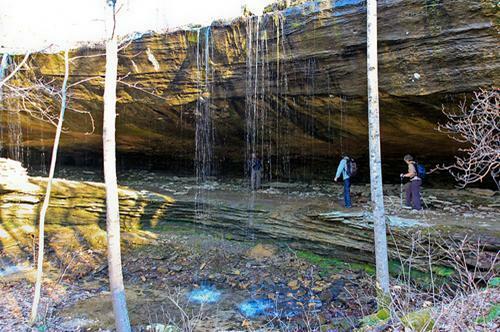 Jim and Faye Lacefield have a 700 acre preserve in the Little Mountain region of southern Colbert County. Jim and Faye will be our leaders once we arrive. Their phone number is 256-381-6301. Look for Linda Sherk at the BBG. Her cell is 205-415-1643 or home 205-671-9779. She can give you directions and additional meet up sites. 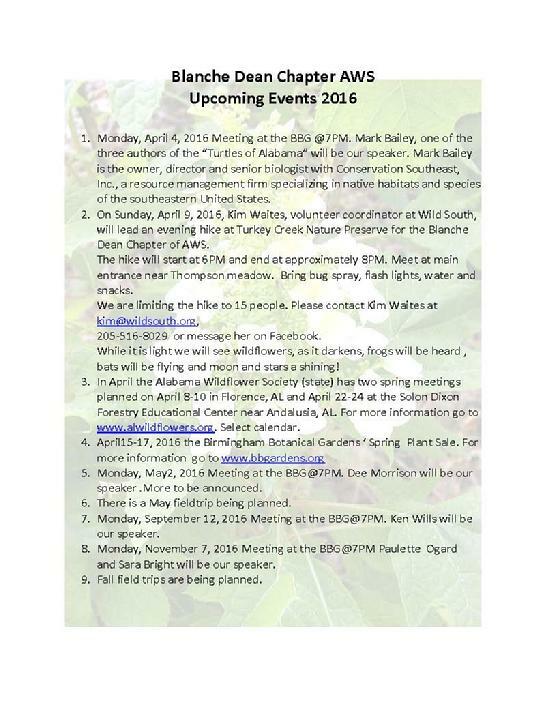 May 23, Saturday Fieldtrip to Augusta Robinson’s Black Belt Prairie near Greensboro. It is our pot luck dinner night so please bring a dish and join us ... speaker to be announced.